At Bliss Tubs, we understand that your walk-in tub should fit your needs. That’s why we have developed a variety of possible adjustments to make your walk-in tub unique to you. Here are some of the optional modifications that can be added to help you get the most comfortable bath possible. Our in-line and bath heaters are some of the quietest available, giving you a bath at the right temperature without the obtrusive hum you’ll find with other heaters. 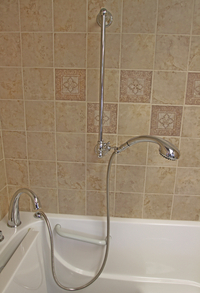 Every Bliss Tubs walk-in tub comes with our 5-piece ADA-compliant faucet set, which includes a handheld shower wand. To complement the wand, we offer a shower slide bar that can be easily and securely mounted on the wall to allow for simple hands-free bathing. 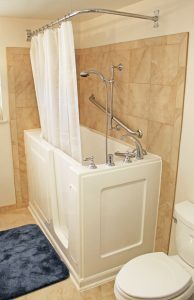 Although most walk-in tub installations are set against three walls in an alcove, Bliss Tubs offers an end panel to allow for one or two wall installations. The chrome-plated Bliss Tubs Shower Rod comes with sturdy, high-quality fittings. Made of 100% EVA vinyl, our shower curtain is built to last. Each shower curtain is treated with an anti-mildew agent to ensure it stays clean. The curtain’s off-white pattern also works well with any bathroom’s decor. Our Ozone Purification System automatically activates to neutralize any potential bacteria from the massage system piping. No harmful byproducts. No difficult upkeep. It does all the work for you. The temperature mixing valve blends hot and cold water to keep your bath or shower at a constant and safe temperature. This prevents scalding and gives you your preferred bathing water temperature. 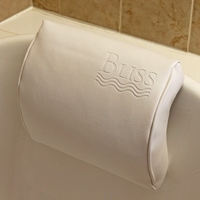 The Bliss Tubs Bathing Pillows allow you to recline against a soft, padded surface while enjoying a warm bath or a steady stream of massaging bubbles. 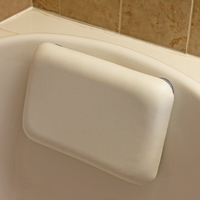 Enjoy your bath on a soft surface with the Bliss Tubs Seat Cushion. Designed to help those with lower back pain enjoy their bath, the seat cushion uses suction cups to securely attach to the seat. Bliss Tubs’ Bathing Support Harness helps those with special needs get a safer and more luxurious bath. Offering torso support, the large buckle and easily adjustable shoulder straps make using the harness smooth and convenient. To learn more about the Bathing Support Harness, read our press release announcement. 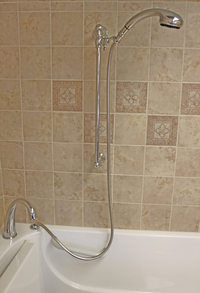 To complement your Bliss Tubs walk-in tub, we also offer the Huntington Brass wall-mounted shower slide bar. This superior accessory is specifically designed for the Bliss Tubs shower wand and offers features not available from many other slide bars, such as easy-grip position settings for ease of use and an extra-strong concealed steel mounting bracket for added reliability.